More than one thousand young girls participated in the event , coming from different schools of Hyderabad.They performed skits on how to protect themselves from child abuse. and the role of She Teams and Bharosa support center taking care of them. A Website was opened by the Commissioner of Police, Hyderabad Mr. Mahender Reddy. He advised the Girls to approach the Police in times of need to protect themselves. Smt Swati Lakra I.P.S. Addl. Commissioner of police , in charge of She Teams &Bharosa presided over the function. Sri P. Raghuveer I.FS Prl.Chief Conservator of Forests, advised the Girls to participate in the activities to bring a change in the society. also their responsibilities to act as change Makers, while empowering themselves. 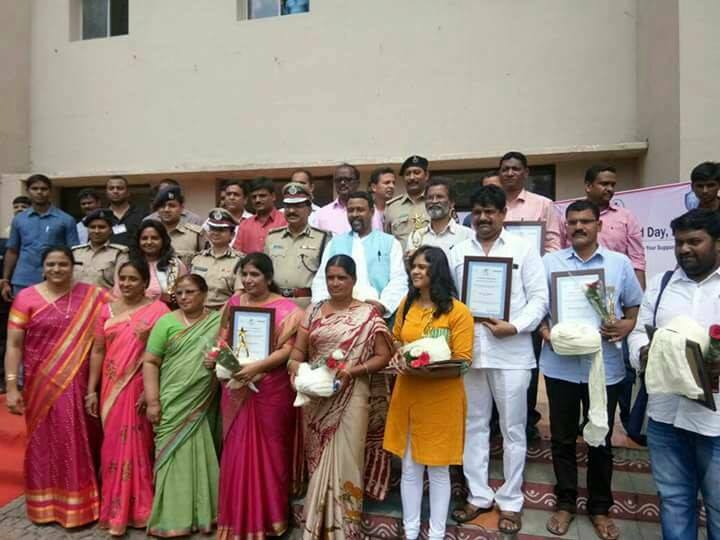 Tharuni identified and felicitated 15 Non Govtl. Organisations and 10 Media Peronnel, both T.V and Print Media, who have been working passionately for the Rights of the Girl Children. 'Balika Bandhu' Awards with citation, Memento and Turbans were given to all of them, enlightening the audience about their work . Dr. Hima Bindu from Niloupher Hospital sensitised the Girls on nutrition, reproductive health and personal hygiene. Smt. Laxmi ,of Rani Rudrama Devi Karate Center demonstrated to the girls how to protect themselves .Dr. Hemalatha Devi, Director ,Tharuni gave Mementoes to the Guests of honour. Police officers, She Teams, Bharosa Teams, School Teachers and Tharuni Team Members,Anuradha, Neeraja, Sameer, Javeed, Ailesh participated in the event. A pamphlet against child marriages was released and booklets were distributed to sensitize on child sexual abuse. The celebrations were televised directly on Youtube by the Doers' guild Software Solutions. It can be watched with the link:'http://bit.do/Tharuni.Girl.Child-Day on www.youtube.com. Tags: International Girl Child Day .